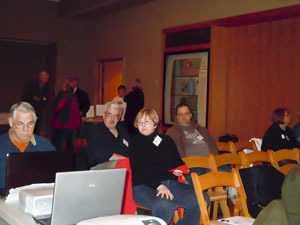 Fred’s presentation was geared to prepare members for the upcoming MAPS Nature Photography Exhibition on March 24 & 25, 2012. He focused on a number of items including but not limited to: Color Management (the limitations of what you print and what you see on your monitor); Monitor Profiling (a two-step process: monitor calibration and monitor profiling with two good systems for hardware & software systems to consider: x-rite Color Munki; Spyder 4 Elite); Choosing a Printer (three most often purchased are the Epson, HP, or Canon). Your best purchase is dependent upon how much you want to print or how much you will be printing in the future. Try and obtain as much info first, so you can understand the total cost involved. Question: Issues with ink sitting unused in a printer—does that affect the printer? Because we live in a somewhat humid environment, we won’t have to expect problems. When you’re in an environment that’s dry, or dry mountain air, then you will have issues. In his discussion about image optimization, Fred has three rules: use the full tonal range, don’t show the viewer any colors they won’t believe, and measure color objectively. Fred takes the following steps before resizing: image evaluation, uses Curves to improve the tonal range, color, and contrast; he adjusts shadows and highlights, hue and saturation, masks for local adjustment, darkens the edges and always saves the master version of the image. Fred continued his presentation on printing, matting and framing; preparing members for the upcoming MAPS Exhibition. 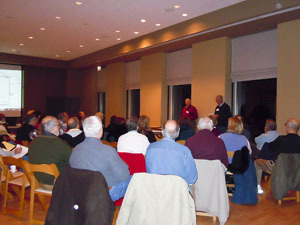 In attendance, there were at least 55 members who listened, took notes, and asked questions. We were all eager to learn from someone who actively exhibits his work. Fred led us through the options of printing in both Photoshop and Lightroom and how best to select certain options in order to produce the best print quality. One of many important tips Fred shared when making prints for a show: print on 8.5 x 11 paper, fill the paper space with the image. Fred tack the prints around his studio and keeps them up for a number of days. After a day or two, he might notice that one print isn’t quite as perfect as he originally thought and a few days later, he may notice that a few more images need some additional work. Many questions were asked and Fred shared his personal knowledge and experience. We walked away with a better knowledge and understanding about the business of printing, matting, and framing. Thank you Fred for an extremely informative and eloquent presentation. Fred’s presentation is available below for your reading. Fred first became interested in making images when he attended Montreal’s EXPO ’67. He tried SCUBA diving at about the same time. He became a certified diver in 1987 and started photographing underwater shortly thereafter. When he started diving, Fred also started doing a lot more land-based photography too. Certainly the skills one uses above the water are identical to those one uses underwater. More to the point however working underwater requires that one be intuitively familiar with one’s camera and all of its functionality, so the knowledge gained on the surface is not only important, but is critical to one’s success underwater. Fred especially enjoys nature photography – both landscapes and macro. Fred continues to enjoy making images both on land and underwater; and he continues his interest in printmaking, both traditional and otherwise. Archival digital printmaking is cutting edge technology that involves hardware and software, new inks and papers, and thereby creates opportunities for creativity. Fred is a member of the faculty at the College of DuPage and a staff lecturer in the Natural History Education Department at The Morton Arboretum. He teaches Underwater Photography, Photoshop and Color Management. Fred is a regular presenter at Our World Underwater, the annual Midwest dive exhibition and symposium. Fred is also a regular columnist for the Photographic Society of America (PSA) Journal. The following four articles are ones he published about the art of printing. Also check out Fred’s website for more of his work.